Look out for my books in SilverMalaysia.com online store and major bookstores nationwide. When I started learning how to invest 10 years ago, I was simply a Computer Science student in university. I had a hard time understanding those ‘Financial Jargons’! It was then when I told myself, one day, I’m gonna translate these boring and complex financial languages into simple and fun financial education programs! Many asked why we (Jonathan Quek and I) named our book “Keep Investment Simple and Stupid (KISS)”. The word stupid does not seem appropriate, say some. Well, there is a reason why we named it that way… That’s why you need to get the book . We do not mean that a person has to be stupid to invest. It is supposed to be keeping investments “stupid”. In other words, one does not need to be a rocket scientist to be a successful investor or trader. Any lay person can acquire the the knowledge of investing, and of course it has to be from someone who has the experience. People always think that “if only we can be as smart/brilliant as Warren Buffet or Mark Cook or Kiyosaki, then we can be successful…” Well , that is not the case. Buffet, despite having a Master of Science in Finance, attributed his investment skills to a simple approach and principles taught by Benjamin Graham. Mark Cook (From the book Market Wizards) was a farmer, and Robert Kiyosaki was a marine. They all learned from other people’s experience (found their “Rich Dad”) and took action. Knowledge + Action = Power, is what I often hear from my partner and co-author, Jonathan. Keep it simple… and I re-quote a quote that a close friend of mine, Brent Penfold, a futures trader based in Melbourne, Australia -“Keep it simple, keep it real”. In the book, we gave a real-life study of a chimpanzee beating top fund managers. Another reason to keep investment stupid and another reason why you should get this book. And I always said, the more you know (I am talking about knowledge, not experience), the more afraid and risk-averse we become. All you need is a simple knowledge on how to trade and invest and this book will give you a kick-start to take action! KISS from both of us. We’ll give you a real kiss if you get the book (Females only, of course, terms and conditions apply) – Benny Lee, Co-author, Keep Investment Simple & Stupid : Invest Like An Idiot & Trade Like A Pro. With the knowledgeable and talented Xeo, who co-authors the Keep Investment Simple & Stupid 5 Elements of Successful Investor book with me, he’s also the brainchild behind financial games such as Capital Gains Game and Wongamania. Financial Youth Intelligence has made Financial Education Fun and Easy for thousands of youths in Malaysia. Now, it custom designs its wit and wisdom for today’s young aspiring investors and young aspiring traders. The company you so blindly pledged your loyalty to retrenched you in the crisis. The fixed deposits and funky investments that promised you security made you a slave. The stacks of money in your pockets cannot buy you children a bottle of milk. You’re in the exciting edge of a new economy with new wealth creation rules. And you still stubbornly held on to your grandfather’s theories! Now, Why Gold? 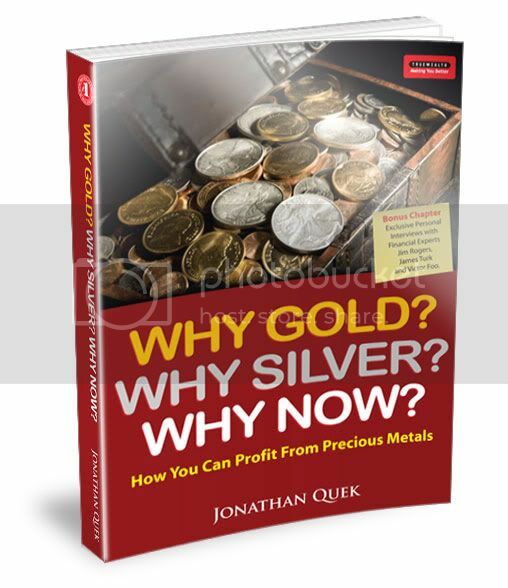 Why Silver? Why Now? with Jonathan Quek taking the driver’s seat, takes you to a world previously hidden from the public and popular media. As you traverse the dark alleys of our financial past, present and future, you might develop disdain for the corrupted, embarrassment for your ignorance and find new courage to relive your life – the rich of life that you were told resides only in fairy tales !